DUNCAN, Okla. – Through much of their careers, Nathan Harp and Wacey Munsell have been considered two of the best in their field. Their business is rodeo, and they are two of the greatest athletes in the game. As bullfighters, they use their bodies, athleticism and any other means necessary to keep everyone in the arena safe during bull riding. It’s a dangerous task, but they’re up for it. That’s why Munsell and Harp have been selected to be the bullfighters for the Chisholm Trail Ram Prairie Circuit Finals Rodeo, set for 7:30 p.m. Thursday, Oct. 18-Saturday, Oct. 20, at the Stephens County Arena in Duncan. It is the second straight year the two will work inside the arena together, but both have been part of the regional finale multiple times before. By being selected, it is recognition that the two men are very good at their jobs. The primary duty is to protect the cowboys directly after they dismount the bull, whether by sure-fire escape after a qualifying ride or by the animal’s discharge. But there are others in the arena, and it’s the bullfighters’ task to keep them all out of harm’s way. 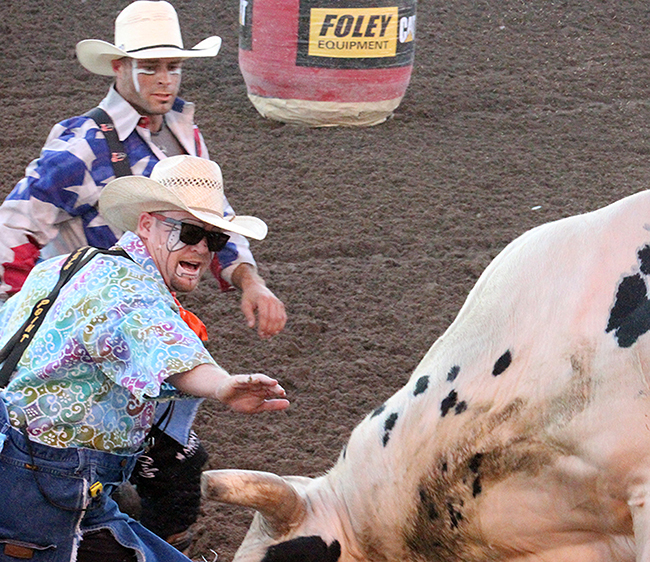 It takes true athleticism to handle a bullfighter’s load effectively. They will work together, gain the animals’ attention and finish by utilizing their athletic ability to remain out of harm’s way. Both men have worked some of the biggest events in ProRodeo. Both were raised in the region, so they comprehend the talent level that sits inside the Prairie Circuit. It doesn’t get much better than seeing all the top cowboys competing inside Stephens County Arena. “What makes the circuit finals great is the quality, both contestants and stock,” Munsell said. “There are a lot of horses and bulls that have been to the NFR, so you know we’re going to have top-quality stock. The circuit usually produces really good cowboys, and a lot are NFR caliber.